how i can fix next button in quazilium theme ? The requested URL /NEWKAUH//page/2 was not found on this server. latest version should had fixed this. because facebook is not working with this theme when I try to share a post? did you try update the theme to v1.4? I want decrease dropdown menu’s animation time. Animation time is very long and i dont have any coding knowledge. How i can do it? 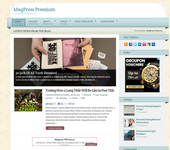 and why when the magpress.com was off I couldn’t edit in theme option. ? that should disable any error message and php warning. how can I remove social widgets from the sidebar ? it looks great really, after i remove all widgets in right sidebar but i want to wide (post-entry) more than default in specific page, can i do that. and the problem of theme option still there. that should fix the paging issue. you can adjust the width percentage% for each in css. look for #left-sidebar, #right-sidebar and #post-entry. The first problem that I want to remove author Icon, how? For the Social Box at the top of the right bar, how do i add the links to the social properties. and if i do not have all those social properties, how do i remove them. How to get rid of credits on the right sidebar? Can I buy it? How do I disable the mobile version? …for some reason, when I test the site in ie7 and ie8… I’m seeing the mobile layout on my desktop. I’m testing this theme in my web, but i have a problem. When i try to create a Featured Gallery Slider i only see a black block. i try with various categories, same result.. any help. Thanks, and sorry for mi English. How in god’s name do I remove the post default header!? I can’t find it anywhere and I’m getting rather annoyed now as I’ve looked in all the codes. I can replace the picture using the same file name but I just don’t want it there. Please help.